Aaron Hernandez’s family says it doesn’t believe he was in a suicidal frame of mind coming off his acquittal in the 2012 fatal shootings of Daniel de Abreu and Safiro Furtado in Boston. On Friday the usually stoic Hernandez was seen smiling at his daughter, whom he fathered with his fiancee, Shayanna Jenkins-Hernandez. In addition, his lawyer, Jose Baez, says he believes that Hernandez was optimistic that he would have his previous murder conviction in the 2013 fatal shooting of Odin Lloyd, for which he was serving a prison term of life without the possibility of parole, overturned. 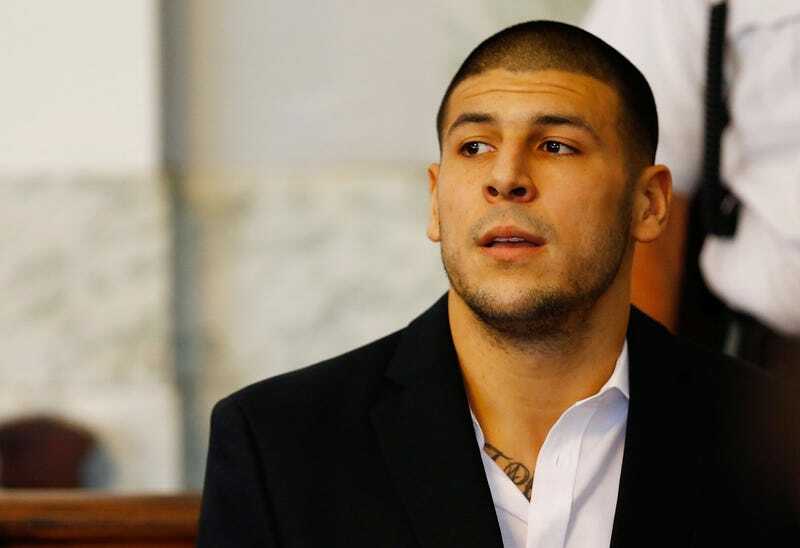 However, on Wednesday morning, Hernandez, 27, was found unresponsive in his cell. Authorities said he used a bedsheet attached to a window in his single cell to hang himself. He was taken to a local hospital, where he was pronounced dead. According to TMZ Sports, Baez said he believes this could be a murder, by either inmates or the folks who run the prison. And Baez isn’t the only one who doesn’t believe that Hernandez would commit suicide. Hernandez’s former agent, Brian Murphy, told ESPN on Wednesday morning that there was “absolutely no chance” Hernandez took his own life. “Chico was not a saint, but my family and I loved him, and he would never take his own life,” Murphy said. Baez told TMZ Sports that Hernandez’s family is devastated and believes he was in a good space and wouldn’t have taken his own life.